A hundred years ago, commercial whaling came to South Georgia. Carl Larsen pioneered shore based facilities to process their catch. The industry thrived and whaling stations grew from a cluster of a few buildings to small towns housing hundreds of workers complete with factories, accommodation, cinemas, sports facilities, cemeteries and churches. However, after only a few decades, the numbers of whales dwindled and the demand for the products made from them dropped off. By the mid-1900’s the whaling stations had largely fallen silent. Over the subsequent years, the sub-Antarctic climate slowly broke down the stations and with it the history and memories that went with them. Although nothing can stop the advance of time and the ravages of the South Georgia weather, new technologies mean that the whaling stations and some of the stories associated with them can be captured in detail like never before. The Government of South Georgia & the South Sandwich Islands along with the Norwegian Directorate for Cultural Heritage commissioned New Zealand company, Geometria, to carry out ground breaking work. Geometria used LIDAR or laser scanning technology along with photogrammetry and drone footage to systematically map the stations inside and out. The laser scanning was achieved by setting up tripod mounted laser arrays within the whaling stations and then by taking distance measurements in all directions. This meant they were able to capture the 3D surface of the buildings and landscapes in breathtaking detail. A scan of a single building creates millions of data points so when the data from all the buildings of the former whaling stations was put together the result was one of the largest data sets of its type in the world containing over 10 billion data points. Processing this amount of information and putting it into a format accessible to members of the public was no small job. A UK based company called Shadow Industries used next generation video game rendering technology to create an application which allowed users to navigate through the whaling station using interactive touch screen displays. These specialist displays also incorporate short films from interviews with former whalers and historic photos. They have been installed in Norway, the Falkland Islands and South Georgia. The incredible data from the laser scans is vital to facilitate better long-term understanding and management of the whaling stations and help tell the story of the whaling stations history. 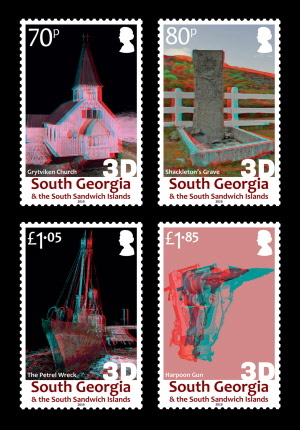 The stamps included in this set show some examples of the 3D datasets, presented in anaglyph 3D. To view these stamps in 3D, red-cyan anaglyph glasses are required. Please note that the ability to view these images in 3D may be limited by some individuals' eyesight. Built in 1913 and consecrated on Christmas day in the same year, the whaler’s church at Grytviken was a key feature of the whaling station. The church is in the neo-gothic style and has a single nave and a small library to the rear. The church fell into disrepair after the abandonment of the station but was repaired to its former glory in the 1990’s and is now an important site for visitors. Possibly the most famous resident of the Grytviken cemetery, the remains of the explorer Ernest Shackleton were laid to rest on South Georgia in 1922 after he suffered a fatal heart attack. Although initially there were plans to return the body of the veteran of the Imperial Trans-Antarctic Expedition to Britain, his wife Emily requested he be buried on South Georgia. Built in Oslo in 1928 the 35m former whale catcher is an iconic part of the Grytviken sky line. Powered by triple expansion coal fired steam engines and equipped with a bow mounted harpoon gun connected to the bridge via a cat walk, the Petrel was once cutting edge technology and allowed whalers to capture fast moving blue and fin whales. Harpoon guns were once a common site on South Georgia. Mounted on the bows of whale catchers, they made it possible to fire explosive harpoon shells deep into the flesh of the whale. Sharp spikes prevented the harpoon from sliding out and later versions of shells injected air to keep the carcass afloat and make it easier to tow the whale back to the ship. A graphic reminder of the whaling stations past.